One thing leads to another. And as I popped in to Lynn’s blog at Nebraska Views to check out her tutorial for a handy luggage tag, one thing led to another and I kept exploring her blog. Unwittingly, she has contributed to my *new-thing-to-learn-today*. 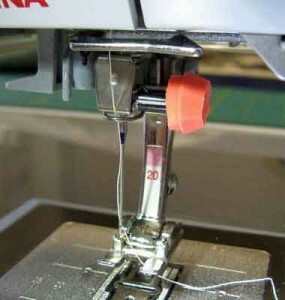 You have to check out her tip for dealing with the needle screw on her sewing machine. It’s just one of those things where you ask yourself: “Now, why didn’t I think of doing that?” Simply genius. Check it out!